Scalable Capital emphasises a scientific approach to investing, but the £10,000 minimum deposit and relatively high fees may put off some investors. 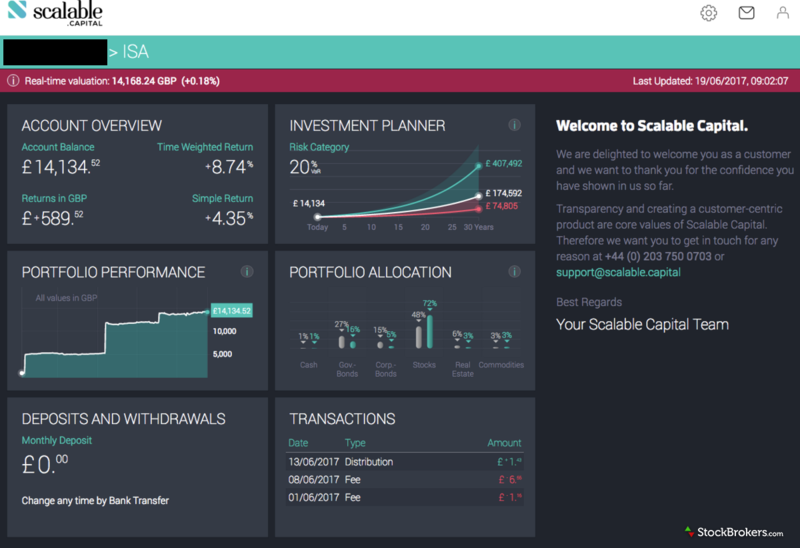 Scalable Capital is an independent company, a London- and Munich-based robo-advisor founded in 2014. The company has raised £9.6 million from business angels and investors in two rounds of financing. The Scalable Capital proprietary risk technology was developed by a Scalable Capital co-founder and academic, Professor Stefan Mittnik, PhD. Scalable Capital invests in all the major global asset classes and regions. The asset classes include equities, corporate and government bonds, real estate, and commodities across Europe, North and South America, Japan, South East Asia, Oceania, the Middle East, and Africa. The investment approach is to invest exclusively in Exchange Traded Funds (ETFs) as they are low cost, liquid, transparent, and offer broad diversification. ETFs are chosen via quantitative and qualitative gauges, which include total expense ratios and total costs of ownership, liquidity, and a close correlation with the underlying index (low tracking error). Scalable Capital differs from its immediate competition (such as Nutmeg and Moneyfarm) in that the investment approach is far more scientific, with a data-driven methodology regarding risk. Rather than a team of investment professionals deciding on the asset allocation and views on risks parameters, Scalable Capital uses innovative technology and the latest capital market econometrics to monitor clients’ portfolio risk. The performance of the investor’s portfolio will be influenced by the ability to keep fees low and the application of risk-management technology that aims to deliver solid, risk-adjusted returns and an empirical investment model. Scalable Capital aims to maintain each client’s portfolio within the risk category defined by the client by combining different ETFs, which mirror the performance of different asset classes. Together with the general investing account, Scalable Capital also offers a tax-efficient Individual Savings Account (or ISA). Scalable Capital has a no-nonsense, flat rate total fee of 0.75% per annum of total assets under management. ETFs used in the company’s portfolios have an average total expense ratio (TER) of 0.25% which is built into the performance of the ETFs. Fees are calculated on a per annum basis, but charged monthly based on the average balance of the client’s account and include VAT. These fees are at the upper end of the robo-advisor market. Moneyfarm charges between 0.4% and 0.6%, depending on the size of the investment, whilst Nutmeg charges the same 0.75% as Scalable Capital, but with fees falling to 0.35% over £100,000 for its fully managed portfolio. A minimum deposit of £10,000 is required, which might put off some investors. Furthermore, partial withdrawals that reduce the total investment below £10,000 are not allowed. As with all robo-advisors, Scalable Capital does not offer direct advice, but the customer service team will answer questions about the company’s service. However, we were not impressed by Scalable Capital’s telephone customer service. When we tried to contact the customer service team during testing, our calls went unanswered and were directed to voicemail. This was disappointing and somewhat surprising, given the competition in the market and the impressive customer support provided by competitors (including Nutmeg and Moneyfarm). When our voicemails were returned, however, the support representatives were very knowledgeable and answered our queries in detail. With respect to email enquiries, the response time was extremely quick, and thorough answers were given. When we signed up as a client for Scalable Capital, the initial information gathering was far more comprehensive than we had experienced with the company’s robo-adviser competitors in the UK. We were asked to provide information on investing objectives, asset class knowledge and experience, and financial situation (including income and expenditure). Next, a portfolio allocation and investment planner were calculated, with performance forecast for five and 30 years. Within the client dashboard it is possible to view the portfolio performance as a chart or table, to see the asset allocation and recent transactions. Scalable Capital has a rather impressive education and research area called "Insights” (the same name as the Moneyfarm report area uses). This area has many articles on numerous areas regarding financial markets and investing, appealing to new investors and more mature, seasoned clients. It is also possible to search the report by category and by most popular, with a standout category of "Women and Investing." 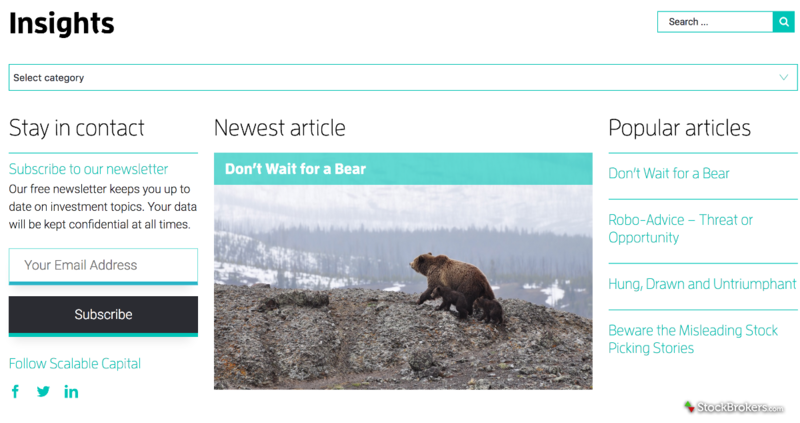 Unfortunately, there is no video content, which we believe would be of huge benefit to clients. However, clients can sign up for a free newsletter and join regular webinars on a variety of subjects, including live Q&A sessions. Lastly, apps are available for both the iPhone and Android phones via Google Play. 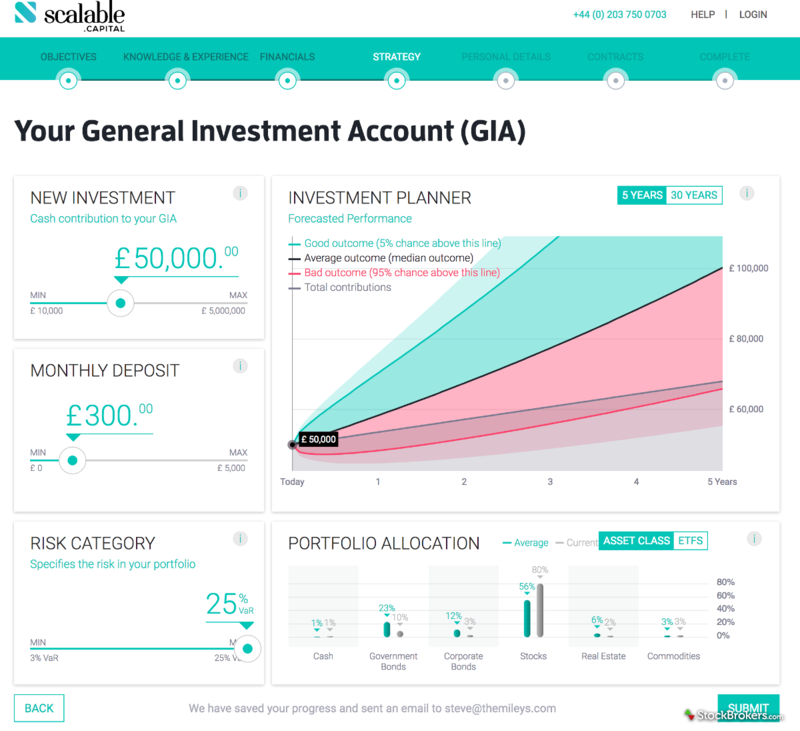 Together with the general investing account, Scalable Capital also offers a Stocks and Shares ISA account, which enables investors to enjoy ISA tax benefits. Although Scalable Capital does NOT currently offer a SIPP (Self-Invested Personal Pension) account, such an offering is currently being developed. Yes, the "science" around the risk-management and investment processes Scalable Capital portfolios offers is exciting, but only time will tell if the longer-term returns produce significant benefits over the company’s main competitors. Moreover, the £10,000 minimum deposit level, fees at the upper end of the robo-advisor industry range, and the disappointing customer service telephone response take the shine off Scalable Capital’s offerings. 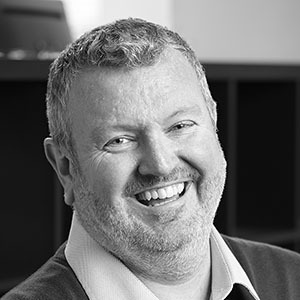 Reviewed by Steve Miley Steve Miley is Director of Research, Europe, for StockBrokers.com and heads the annual UK Share Dealing Broker Review. With 25 years of experience in institutional financial markets, Steve has won multiple Technical Analyst Magazine awards, including "Best Independent Fixed Income" and "Best FX Research." Alongside StockBrokers.com, Steve is the founder of The Market Chartist where he provides market research for institutional clients.